Lately I've been interested in Kickstarter, and I keep finding interesting Kickstarter projects to back. This is my second Kickstarter post recently, and I don't want to turn this into a Kickstarter blog, because that would change the purpose of the blog. So instead, I decided to start a new Tumblr called Kickstarter Addicts to post those projects I find interesting. 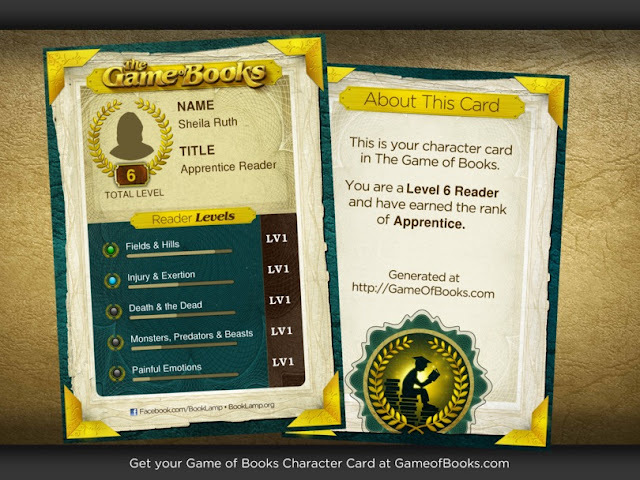 To kick things off, I wrote about a really exciting project called The Game of Books. It sounds like a fun game that both kids and adults would enjoy, and I want to play it! The picture above is my game card from the demo of the game. If I remember right, I entered Ratha’s Creature, Dune, Dust & Decay, and The Hobbit. I may also have entered The Hunger Games but I can’t remember for sure. Read more about it on my Kickstarter Addicts post! While you're there, I hope you'll follow my new Tumblr!